Water purification processes and technologies differ, but they generally follow a series of steps to produce water safe for drinking and cooking. During ozonation, wastewater is infused with ozone to deactivate pathogens, degrade pollutants and destroy odor-causing compounds. Then, biological activated carbon helps remove byproducts of ozonation. During that process, organic matter adheres to the activated carbon, filtering it out of the water. 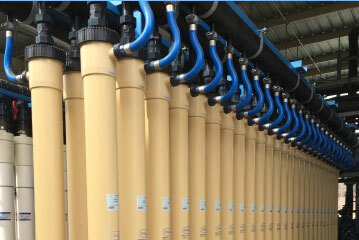 Microfiltration or ultrafiltration is an early step in the potable reuse process. At this stage, water enters microfiltration or ultrafiltration cells and is forced through a fiber-filled module with microscopic pores that can be 300 times narrower than a human hair. These pores are so small that most impurities are too large to pass; they remove particles, bacteria and viruses before water moves to the next step of purification. 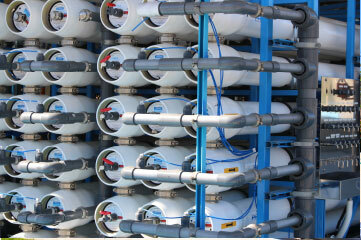 During reverse osmosis, high-tech membranes filter out additional impurities such as salts. 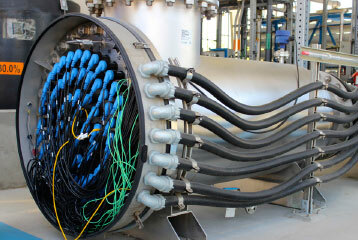 This technology has been used to create drinking water on naval ships and space stations for decades. It involves forcing water through membranes with pores that are 0.002 microns or smaller and only allow water molecules to pass. Minerals, calcium, chloride, sodium, chlorine, salts and dissolved solids are removed. Finally, water reaches the ultra-violet advanced oxidation process. In this step, UV light splits primary oxidant (e.g. hydrogen peroxide or ozone) molecules, producing highly reactive hydroxyl radicals. The hydroxyl radicals quickly react with any remaining organic contaminants in the water, breaking them into simple elements such as oxygen, nitrogen and carbon. 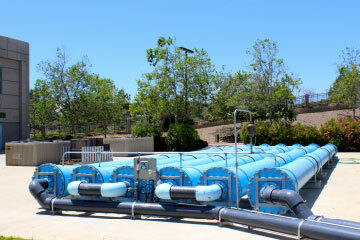 Municipal collection systems gather wastewater from homes and businesses, then convey it to treatment plants. 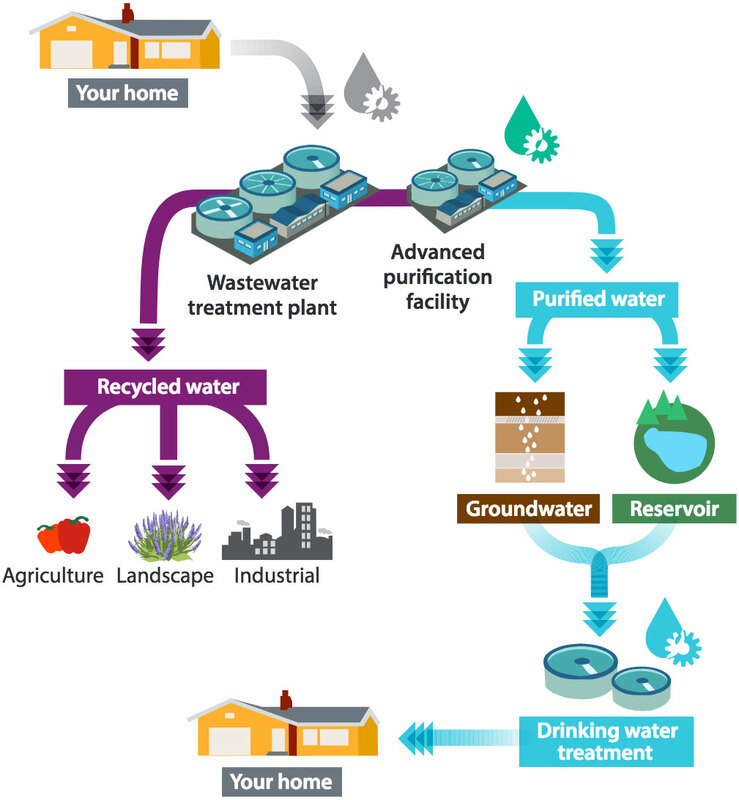 Water treated to the tertiary level can be reused for non-potable purposes such as landscapes and agricultural irrigation, or for industrial uses such as cooling towers. Additional treatment at advanced purification facilities produces high-quality drinking water using microfiltration, reverse osmosis, ultraviolet light/advanced oxidation and other technologies. Purified water is returned to the drinking water system through aquifers or reservoirs for potable use. Public drinking water systems treat water from aquifers and reservoirs using techniques such as sedimentation, filtration and disinfection to ensure a pure, safe water supply that meets state and federal standards. Purified water – blended with other water supplies – is delivered to homes and businesses around the region, restarting the urban water cycle.